The photo above shows Orion rising above a spruce forest near Bad Kleinkirchheim, Austria, on a crystal-clear winter's night. This part of the sky embraces the most conspicuous stars visible from the Northern Hemisphere. 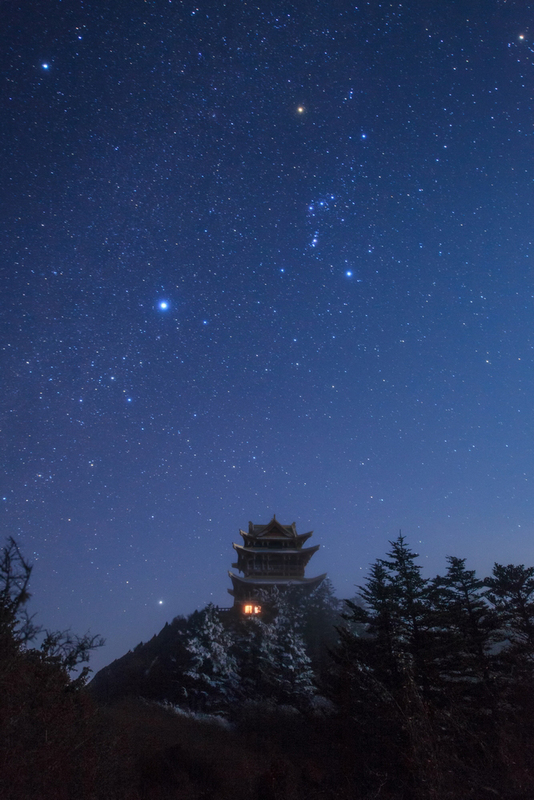 In addition to the stars of Orion, Sirius, the brightest star in the night sky can be seen peeking above the horizon (lower left-center). Procyon is at upper left, brilliant Jupiter is at upper right-center, the Pleiades cluster is just above and to the right of Jupiter, while Aldebaran is the bright star just to the lower left of Jupiter. Photo taken at the bottom of a ski run on January 30, 2013. See how many stars you can count in Orion with your unaided eye on a clear night. By doing so you’ll help scientists measure the effects of light pollution around the globe. From the data collected, an interactive map of all worldwide observations will be created. The current observation campaign lasts until April 9; the final campaign of 2013 runs from April 29 - May 8. To submit your results click here. Photo details: Camera Model: Canon EOS 400D DIGITAL; Lens: EF-S10-22mm f/3.5-4.5 USM; Focal Length: 10.0mm; Aperture: f/4.0; Exposure Time: 30.000 s; ISO equiv: 800; Software: ACD Systems Digital Imaging.